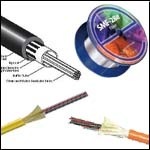 This article describes the main factors in designed high quality fiber optic cables. Fiber Optics For Sale Co. stocks all types of fiber cables. You can find the fiber cable products here or click on the following picture. For fiber optic cables to be real alternatives to copper cables, they must be able to be safely installed and maintained in all environments where metallic conductors are normally installed. Fiber cables must have very good mechanical properties to work in these environments such as underground ducts. However, glass optical fibers themselves are very brittle and very susceptible to mechanical handling. Therefore, the bare glass fibers are surrounded by protective layers including coating and cabling to be able to handle the mechanical impacts in installation and maintenance. There are four main functions of the fiber cabling: fiber protection, maintain fiber transmission characteristics, provide high cable strength and the identification and jointing of the fibers within the cable. And the cable design must take account of these requirements. Based on above requirement, fiber optic cables are designed based on four characteristics. Let us examine them one by one below. Bare glass fibers are composed of core and cladding and both are based on silica or other glass materials. The glass surface are susceptible to abrasion and mechanical flaws. To protect this bare glass fiber, a UV material coating is applied to it during the fiber drawing process. This diameter of this primary coating is usually 250um for single mode and multimode fibers, but 400um is also very common in polarization maintaining fibers. A secondary buffer coating is then applied to the fibers to give protection against external mechanical and environmental factors. This layer may take different designs and its main function is to prevent micro-bending losses. A. 900um tight buffer. A 900um diameter hard plastic material is coated as the secondary buffer layer. The material is usually Nylon, Hytrel or Tefzel and it provides stiffening for the fiber against outside microbending influences. B. Loose tube. Another alternative approach to a direct tight buffer coating is to use a 900um loose tube. The 250um or 400um bare fiber is placed in an oversized loose tube in which the fiber is mechanically isolated from external forces. C. Filled loose tube. The loose tube discussed above can be filled with moisture-resistant compound which provides mechanical protection and a water barrier layer around the fiber. This filling material is generally petroleum or silicone-based compounds. 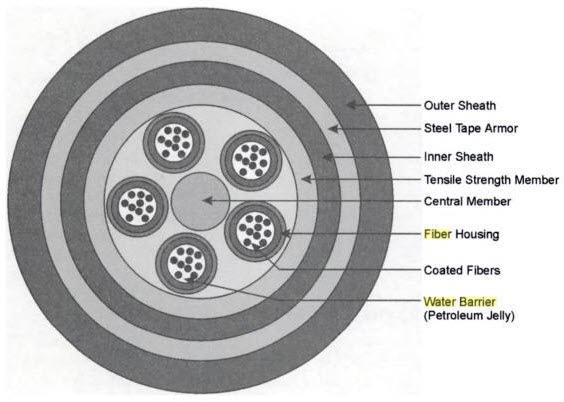 For large fiber count cables, a structural member is placed in the center of the fiber cable to provide a foundation that buffered fibers are wrapped around. In most cases, this central structural member also serves as the strength member to function as the primary load-bearing element. Structural and strength members can be solid or stranded steel wire, Kevlar or fiber glass materials. They must have a high Young’s modulus, high strain capability, flexibility and low weight per unit length. Kevlar is an aromatic polyester trademarked by DuPont. It is used as strength members widely. The fiber cable must be covered with an outer sheath in order to reduce abrasion and provide protection from outside mechanical forces such as crushing. This layer is usually made of plastics and is called fiber cable jacket or fiber cable sheath. The fiber cable jacket contains the cable core and has various complexity from one simple extruded plastic jacket to a multilayer structure consisting of two or more jackets and with intermediate armoring. Fibers are susceptible to long-term degradation caused by hydroxyl ion contamination. But the plastic sheath material tends to give very limited protection against the penetration of water into the cable. This is especially true for submarine fiber cables which may be subjected to the static pressure of several kilometers of seawater. Common water barriers for ordinary cables include: an axially laid aluminum foil/polyethylene laminated film immediately inside the polyurethane or polyethylene plastic sheaths; and/or the use of moisture resistant compounds around the fibers. Moisture resistant compounds include petroleum jelly and silicone rubber. These filling compounds need to be soft, self-healing, easily removed, provide corrosion protection for metallic cable components and do not degrade over time or harm the other components. These materials have another useful property in cushioning the fibers from vibration.